Lots going on - so much, in fact, that it deserves its own spotlight. Check out our Earth Month 2019 page for all the wonderful community events happening this month. We're down to a few more events for April. Good luck getting to all of these! April 25 - Trees and Climate Change – Act Locally. Panel Discussion (including us! ), 7:00 - 8:30 pm, Interdisciplinary Science Building @ UM, Rm 110. ​​April 25 - ZERO by FIFTY Community Series: Plastic. 5-7pm at the UM FLAT. Join great local panelists for a conversation about reducing plastic waste in Missoula. April 25 - 100% Celebration. 5:30-7:30 pm, Union Hall, 2nd Floor. 208 East Main. Give thanks to the Board of County Commissioners + City Council for votes to move Missoula to a 100% clean electricity by 2030. 350 Montana and the MT Sierra Club and Climate Smart invite all to a pot-luck dinner with beverages, music, and more! This month's meetup was on Local Food & Agriculture - thanks to all who joined! Next up: HEALTH + Climate, May 9. Lots to talk about! The 2019 Meetup schedule is to the right. Note we're meeting the SECOND Thursday of the month now. Our next Meetup -- on HEALTH and CLIMATE -- is May 9! Our April meetup was all about local food & agriculture and we heard from our friends at CFAC and awesome local farmers and foodies. Blog to be posted soon. Thanks a lot to everyone who came out to our March meetup on Zero Waste - always a popular topic and great to have our pals at Home ReSource there to navigate. Check out our BLOG for some pretty darn exciting new zero waste resources and opportunities to get involved! February 14: We <3 sustainable transportation! We had an exciting conversation about all the movement that's happening in Missoula to get our community busing, biking, and walking. Check out Anna's blog post here for a recap& how to get involved on this issue. ​January 10: We kicked off 2019 with renewable energy! Our meetup was jam-packed with information and action items. Check out our recap here. December 6: Our last meetup of 2018 was our Year 3 Celebration! Thanks to all who joined us for a great evening, and congrats to our Smarty Pants Award winners! November 1 - we talked all about Sustainable Economic Development. Yep, we posted a blog about it! October 4: Transportation and Smart Growth. Anna, our Energy Corps member, wrote a great blog recapping the conversation + what you can do. September 6: Renewable Energy - from options to advocacy to 100% Clean Electricity. Planning a path forward. August 2: ​Water Protection and Conservation and the nexus of water + climate + energy. Great talk with the Clark Fork Coalition and other water experts. The recap is on our blog here. June 7: Healthy Communities was our meetup topic. We had a wonderful wide-ranging conversation - read our Intern Mattie's excellent BLOG. ​​May 3: Local Food and Agriculture: we partnered with local non-profits and farm and food businesses to discuss growing food (and not wasting it) in a changing climate. Frequent the Farmer's Markets and compost! ​April 5: Urban and Wildland Forestry. Karen with Trees for Missoula and Marie from the Urban Forestry program. Check out our blog and this Missoula Current piece: Celebrate (and tend) our urban forest year-round. Climate Smart hosts Monthly Meetups at Imagine Nation Brewing. Each meetup focuses on one of our "buckets". These informal gatherings are a great way to learn about what's happening on climate in our community and how you can get involved. Let us know if you or your organization would like to partner on any of the meetups. We were honored to partner with Soft Landing Missoula on a recent event featuring journalist Todd Miller who spoke about the connections between climate change and human migration - a fascinating topic. We had a great time at our Year 3 Celebration on December 6 - thank you to all who joined us! We especially enjoyed our annual Smarty Pants Awards presentation - go HERE for more about this year's fabulous winners. Our first annual Missoula Clean Energy Expo on October 20 was a smashing success! With over 25 great businesses and organizations, including solar installers, as well as informative workshops and a special appearance by Mayor Engen to release the draft Options Report for 100% Clean Electricity, we made the most of this beautiful, sunny day. We're excited to bring the Expo back again, even bigger & better in September 2019! Missoula People's Climate March, Sunday September 9. An awesome gathering at Anderson Park (near Rockin' Rudy's) with great speakers, then a march across the bridge to join the festivities at Sunday Streets. Photos are up! Read about it here. Thanks to all who helped "Green" the River City ROOTS festival! We introduced composting this year, thanks to Missoula Compost Collection LLC, helping divert lots more waste from the landfill. "Climate Change in Missoula: From Statistics to Strategies", February 13, 2018 - We co-hosted this great event with the League of Women Voters and Clark Fork Coalition. Panelists from Climate Smart, CFC, and authors of the September, 2017 Montana Climate Assessment shared forecasts for the Missoula area derived from world climate change models discussed how Missoula is responding. With MREA and other great partners, we put on two Solar-Ease workshops in Fall 2017 & Spring 2018 - all the resources from these events are HERE, and it's still a great time to go solar, so check it out and share with friends! ​Montana’s Changing Climate: The State of Climate Change Science in Montana panel with Montana scientists, June 5: If you missed this fascinating presentation, check it out on YouTube here! Missoula Gives was a fantastic success! We raised $4780. 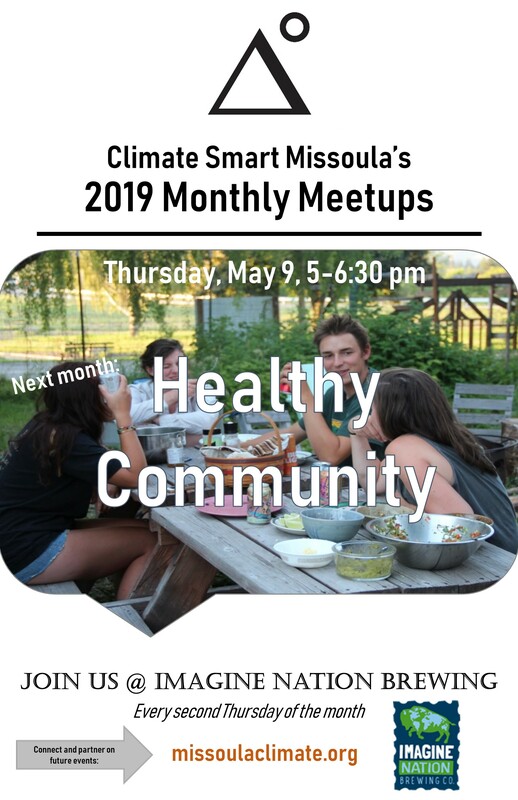 It's always a good time to become a Friend of Climate Smart Missoula and never too late to support our work. Thanks All. Check out articles, videos, and photos from our first Peoples Climate Solidarity March and Rally - 2017. ​APRIL was Sustainability Month and Earth Day! Our Show Up for Solar Solstice Rally was great! Thanks to co-sponsors: 350 Missoula, AERO, Hellgate SAVE, Missoula Community Foundation, Montana Conservation Voters Ed Fund, Montana Renewable Energy Association, MontPIRG, and the Mt Chapter of the Sierra Club. Awesome to have SBS Solar and Jordan Solar with us - great partners! ​Our first Community Art project - Adaptation and Resiliency was a huge success. Thanks for coming. CHECK IT OUT HERE.